Latino Public Broadcasting announced that season four of VOCES, the Latino arts and culture documentary showcase series, will premiere in spring 2015 with three new broadcasts on Fridays at 10:00 p.m. ET from April 17 to May 1, 2015 (check local listings) on PBS. A fourth film, “Pedro E. Guerrero: A Photographer’s Journey,” will premiere this fall as a special co-presentation of VOCES and THIRTEEN’s American Masters. VOCES is presented by PBS SoCaL. explores the ups and downs of being a Latina actress in Hollywood through the lives of the five women who dub “Desperate Housewives” into Spanish for American audiences — and whose real lives are often as dramatic and desperate as those of their onscreen counterparts. “El Poeta” (May 1) is a powerful and poignant profile of the renowned Mexican poet Javier Sicilia, who ignited an international movement for peace after the brutal killing of his 24-year old son — collateral damage in a drug war that has left more than 100,000 dead or missing since 2006. 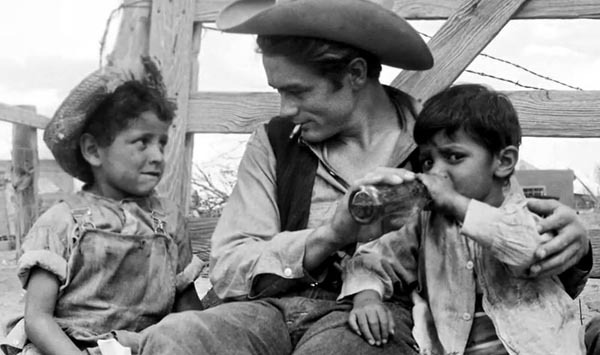 Actor James Dean with Mexican children during the filming of Giant. In the summer of 1955, it seemed as if all of Hollywood had descended on the dusty West Texas town of Marfa as production began on the highly anticipated movie Giant,starring Elizabeth Taylor, Rock Hudson, and James Dean. Based on Edna Ferber’s novel about three generations of a powerful ranching dynasty, Giant took an unflinching look at feminism and class divisions and was one of the first films to explore the racial divide between Anglos and Mexican Americans in the Southwest. Now, 60 years later, “Children of Giant” goes back to Marfa. The film combines interviews with the cast and crew of Giant with the recollections of residents who participated in and witnessed the making of the film, many of whose lives mirrored the controversial themes of the film. A fascinating look at a rarely seen side of Hollywood, “Now en Español” follows the trials and travails of five hard-working Latina actresses who dub “Desperate Housewives” for Spanish language audiences in the U.S. With real lives that are often as dramatic and desperate as those of their onscreen counterparts, the five dynamic women featured struggle to pursue their Hollywood dreams while balancing the responsibilities of paying rent and raising children. The film chronicles their lives as they audition for parts and work in the dubbing studio while striving for a career that offers more prominent – and on-screen roles. Both heartbreaking and inspiring, “El Poeta” tells the story of renowned Mexican poet Javier Sicilia, who ignited mass protests and an ongoing international movement for peace after the brutal killing of his 24-year-old son Juan Francisco – collateral damage in a drug war that has left more than 100,000 dead or missing since 2006.Filmed over the course of three years, the film follows the journey of Sicilia and his movement as they make their way from Mexico’s most embattled cities – Juarez, Chihuahua, Durango and others – to the U.S., urging American citizens and lawmakers to share in the responsibility for the violence. “El Poeta” transforms the hard news story of drugs, murder, and corruption into a deeply personal examination of the impact of the ultimate loss on the human psyche – as well as the power of righteous protest.